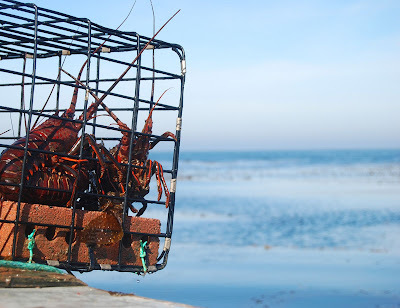 The goal of this website is to inform you of the local seafood products harvested by Wild West Commercial Fishing, as well as the seafood products caught by commercial fishermen of the San Diego, California region. Hello! My name is John Law, and I am an active coastal commercial fisherman operating out of Mission Bay, in San Diego, California. I have been commercial fishing the last 26 years, preceded by 13 years in the commercial party-boat fleet, totaling 39 years of my 'office space' being out on the ocean. My 25' and 20' skiffs dubbed the "Wild West" and "Rock Ridge" are keeping me afloat while participating in multiple fisheries, including lobster, crab, and a variety of fishes (rockfish, sheephead, cabezon, halibut, ling cod, shark, white sea bass, and several others), predominantly using trap and hook and line methods (please visit the Seafood Calendar). Additionally, I am a fully licensed and insured seafood vendor, which allows me to self-market my catch. I sell 100% of my take to a variety of local and regional restaurants, markets, and the general public (and occasionally, I eat one for dinner!). I feel fortunate being a life-time San Diegan, deriving my livelihood from local waters and communities over the course of three decades. Fishing is a humbling occupation that requires continuous internal evolution in knowledge and decision-making in order to adapt to and survive within chronically changing oceanic, economic, and political conditions. Over the years, I have accumulated and endured a variety of experiences and encountered a vast assortment of characters within the marine industry, whether they be human players---old timer fishermen, marine suppliers, sport-fishing hobbyists, divers, surfers, kayakers, tourists, restaurateurs, seafood lovers, border patrol, the navy, customs, California Department of Fish and Game officers, scientists and researchers with diverse expertise, National Marine Fisheries observers, environmental non-profits, journalists, politicians---or non-human players, including several species of whales, dolphins, seabirds, fishes ranging from great white sharks to mola-molas, oddball invertebrates, kelp forest bursts and die-offs, and plankton booms and busts associated with upwellings (or lack-of). I have even witnessed and persisted through various climactic events and longer-term oceanic mood swings, such as the Black Sunday, severe Santa Ana winds, El Ninos, post-tsunami marine biogeographical shifts, and longer-term warm- and cold-water cycles (this website will further elaborate such topics). 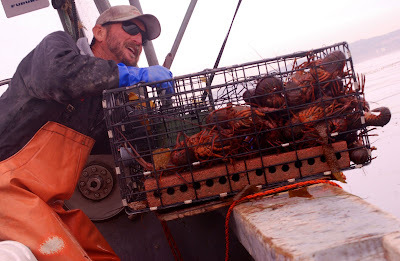 Traditionally, I am labeled as a "commercial fisherman," but more appropriately, I consider myself a "California State and Federally Licensed Marine Resource Harvester," or a professional, small-scale or "artisinal" harvester of intensely regulated and managed marine resources, collectively owned by the citizens of California and the United States. As an advocate of product and price transparency, I think it is very important for consumers to know where their seafood comes from---the people, places, and practices involved when marine resources are captured, transported, and/or altered, from the ocean to the dinner table.... And ultimately, how one's knowledge of this elaborate process affects the aggregate value of seafood by the end-users. This website also emphasizes the importance of eating seafood from local fishermen, such that consumers can directly observe and participate in the process of harvesting, distributing, preparing, and consuming seafood. To keep in mind, the most limited resource in southern California's local seafood industry is by far, the integrity of the vendor. Hence, this website is a stepping stone to building trust (this site will have a future article on this topic). Having said this, thank you for your time and consideration, and please free to further explore this website and/or contact me for further inquiries!